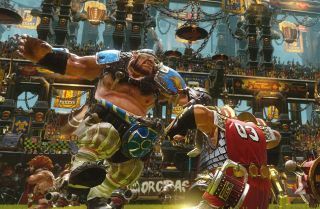 The new engine is the big reason to follow Blood Bowl 2, the underlying rules developed by Games Workshop in 1995 are still perfectly capable of producing farce on the football field. Developer Cyanide says its striving for a "fresher" look that improves "clarity and comprehension of the action on the field". They've also put a lot of work into animating Blood Bowl's bumbling players, as you can see in the latest trailer, starring the humans, who aren't especially good at anything, but pass basic IQ requirements that Orks sometimes struggle with. The game's due out in Spring, and a shiny new website has launched with extra details, including news of a story-driven campaign following the resurgence of the Reikland Reavers. If it's anything like the last game, the real fun will be in creating leagues with friends, which tend to create ridiculous but surprisingly intense rivalries.